A grey ship heading into a grey loch this morning. 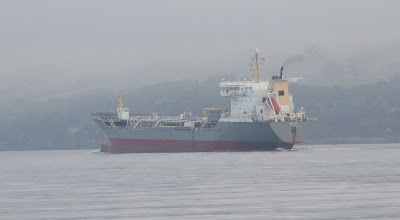 The Swedish 16,755 tonne deadweight tanker NAVIGO, built in 1992 by Kvaerner Masa Yards Ltd at Turku in Finland, headed for Finnart this morning to load products from the Grangemouth refinery. She is owned by Rederi AB Donsötank, and is currently operating for Brostrom Tankers. NAVIGO has an overall length of 142.3 metres, and when fully loaded, her draft is 9.265 metres.